LIMITED PRESSING OF 1000 copies. Originally released in 1982. Recorded mostly live at Hyde Street. Mastered at A&M. "Heart Beat" is mislabeled on the tracklist as "The Phantom Of Sanity." Tracks 5 and 7 are reversed on the tracklist. This is my preferred release of 3rd From The Sun. The Cleopatra reissue from 2011 is fine, but uses some brickwall limiting, so it's missing some resolve and dynamism. The incorrect information on the back and the different colored text is because the packaging is based off of the original USA Siren release, which inexplicably has incorrect titles and track ordering. My guess is that they were still figuring out the tracklist when Damon wrote the text onto the sleeve graphics,(Future Ghosts may have had a working title), and somehow it went out to people in that state. The sound quality is great, no real flaws, thankfully. 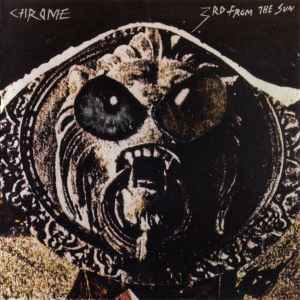 Of all of Chrome's albums, this one has been lucky enough to get good distribution and not have any awful versions.